De Luxe 4 bedroom villa, Pool & tub heating included. New rates for April -July. Beautiful 4 bedroom villa with heated pool & hot tub & aircon, inclusive price. We have just set new reduced rates for the gaps in our calendar. Please take a look. They are unlikely to be available long. Breaking news! We have installed solar panel heating for the pool, which reduces our carbon footprint, and is much more eco-friendly. It is up and running immediately, and is such good news for all how care about energy consumption! Casa Palmeira is simply a fantastic place for a holiday. It does have a special kind of magic, and we love to welcome new guests to come and enjoy. We think Casa Palmeira has everything you could want and need - relaxation, privacy and space, with lots to do and see on your doorstep. The price for every rental includes pool heating from the beginning of May to mid-October, and hot tub heating all year round, as well as all bed linen, pool and bathroom towels. It also includes free wi-fi. We have just installed an electronic pool cover - so easy to operate, and it means the pool will stay warmer. Must be good news! Our new solar panel pool heating is now operational. As a bonus, it will operate out of season as well as in high season. The pool temperature out of season is entirely weather dependant, and as it’s our first year of operating solar pool heating, we’ve yet to see how it does in the cooler months, but if it’s sunny, it will be better than an unheated pool! Watch this space as we monitor the off-season temperatures. Parque da Floresta has recently been rebranded, and is now known as Golfe Santo Antonio. There is so much on offer here, for golfers, non-golfers, and families - golf, driving range, putting, bowling, tennis, pools, football, and children's club, as well as restaurants, all within the resort. Casa Palmeira sits on the edge of the 12th Fairway, in what we think is the best location in Parque da Floresta. The villa is in a quiet cul-de-sac, with just a few villas nearby. It is very private, with an enclosed garden, heated pool, hot tub, and mature garden. The villa is well-equipped and very comfortable. The accommodation is on 2 levels. On the upper level there is the sitting-room, dining-room, kitchen and utility room, the study, and the master bedroom suite. The sitting –room leads on to the upper terrace, which has several different areas for eating and relaxing, as well as a sun awning, for a bit of shade. There are, in both the sitting-room and the study, literally hundreds of books (1200 at the last count!) for you to enjoy during your stay. We are serious book lovers, and sometimes a kindle just isn’t so good for reading in the sun. There is also a substantial video library, with many films from Disney to action films. We also have satellite channels on the study TV, and free to air UK channels in the sitting-room. The study also has an Xbox 360 games consul, with a few games. Entirely up to you if you let your kids – even the big kids! – find it or you hide it away. The Master suite is a big airy room, with access to the upper terrace, and windows over the pool and garden. There is a dressing room, leading to the ensuite bathroom, which has a spa bath, twin basins, toilet, bidet and separate shower cubicle. The kitchen and utility rooms are well equipped and very functional. The kitchen has an electric hob & oven, microwave, dishwasher ( essential), and fridge freezer. There is a further fridge freezer in the utility room, along with a washing machine and tumble drier. Downstairs, with access to the pool and garden, are a further 3 bedrooms, one of which is ensuite, and the other 2 share the family bathroom. There is also a small kitchen, which is great when you are BBQ-ing on the lower terrace. All 4 bedrooms and the study have aircon units which supply cool air, and also hot air for the winter months. Outside is special. We have over the years totally landscaped the gardens, and there are lawns on lots of different levels. We are enclosed by a large hedge, which gives us amazing privacy. The pool is created with unusual green tiles, and is heated. Heating is included from 1 May to mid October, and out of those times, the solar heating will be operating, but as it depends on the sun, the temperatures are not guaranteed. It will still be warmer than an unheated pool, and there is no charge for it. The pool is 3.5m wide by 11m long. Shallow end depth is 1.2m, and 1.9 at the deep end. We built the hot tub quite recently, and it is a great addition. It seats 5-6 easily, and has lights for evening use. Hot tub heating is included all year. Also we have a roof terrace. Very exciting, and it adds a new dimension to the villa. 360 degree views, and sun all day long. Such a great addition - we think. Hopefully you will think so too. Last summer we had great fun creating a short video of the outside space at the villa. Our son, Ben, composed and played the soundtrack. It is in the photo section of this website. I hope you will have a look! Casa Palmeira is within walking distance of the clubhouse and spa at PdF, and it is about 10 mins by car to the lovely beach at Salema. We think Casa Palmeira has everything you could need for a great family holiday, but that still doesn't quite say it all. It doesn't explain why our guests come back year after year, and why it is just an amazing place to spend your precious holiday. It is impossible to put your finger on it, but whatever it is, it makes Casa Palmeira special, and just a little bit different - doesn't feel like a holiday villa, feels like home! We are Chris & Margo Addison-Scott, and we live in Fife, Scotland. I was a lawyer, now retired, and Chris is a Chartered Surveyor. Since I gave up the law, I run the family farm, and gardens, and a little home based business making candles and reed diffusers! Have a look at www.mia-candles.co.uk. Much more interesting than being a lawyer! We have 3 children, Alexandra who now lives and works in London, Jamie is working in Edinburgh, and Ben is at Glasgow University. We bought Casa Palmeira about 11 years ago, having been looking at property in Parque da Floresta for several years before that. It was a big investment for us, and it was really important to get the 'right' villa. When we walked into the villa for the first time, we just knew it was the one! We bought it from a Dutch family who had designed it, with great attention to detail, and it just seemed perfect. Location in Parque da Floresta was, for us, critical. We wanted to be frontline on one of the fairways, and in the 2nd Phase of the development, which meant that we weren't up on the more exposed, windy, hillside. The garden was in need of a bit of work, but is now exactly the way we want it. It is peaceful and private, and isn't overlooked by other properties - perfect! It is just a special place. It is peaceful and quiet, but near enough to the fabulous beaches, towns and villages of the Algarve to let you enjoy them whenever you want. We are always amazed at how friendly and helpful the Portuguese people are. Most people in shops and restaurants also speak English, so getting about is very easy. We enjoy walking, and there are so many places to walk from the villa. The National Park borders Parque da Floresta, and it is a joy to walk into the hills above the Parque, and see the views to the sea. We have also now discovered a walk through the countryside down to the beach at Salema - about 2.5 miles by the scenic route - so it's great to walk down, have lunch, and maybe walk back ( or more likely decide that we've had enough exercise for the day, and we get a lift from Jose or Isabel, our local friendly taxi drivers!). We quite simply love the villa, and from the reviews that previous guests have left, it's clear that they love it too. The views are spectacular, especially from the new roof terrace; the pool is glorious; the garden is a joy. The whole area just seems to promote a lovely sense of wellbeing, and there is enough space to let the whole family relax and unwind. We really hope you will come and experience our lovely villa. En-suite bathroom with shower cubicle, corner spa bath, toilet, bidet and double wash hand basins adjacent to master bedroom. En-suite shower room adjacent to bedroom 2 (no bath). Family bathroom with bath and over-bath shower, between bedrooms 3 and 4. Logs supplied at cost during cooler periods. There is large sitting room with patio doors onto the upper terrace. The room is equipped with wide screen digital TV, with freesat channels, DVD player. Lots of books, and a huge selection of DVDs. We provide an ipod docking station too. Lots - mainly from John Lewis in the UK, but also local dishes too. Spacious, fully fitted modern kitchen, with oven and hob, microwave, fridge/freezer, and dish washer. The kitchen is well equipped with cooking utensils, glasses, pots and pans, mostly from John Lewis. There is also a table and 4 chairs in the kitchen. 1200 at the last count! The Parque da Floresta Golf Course was created in 1994 and is billed as one of Europe's most picturesque. Measuring 5587 metres from the white tees, the par 71 course has varied holes running along valleys, past eucalyptus covered ravines, flanked by olive, palm and pine trees. No two holes are similar. Our guests enjoy a 40% discount of green fees. Buggy hire is also available. Other courses are available at Boavista, Palmares, Penina and Alto Golf. Heated by solar panel heating. Out of season, the solar panel heating is still operational, but the temperature is at the mercy of the weather. But it’s free, and always better than an unheated pool! So nice!!! And always included in the price. Notes on accommodation: Fully licensed by Portuguese Authorities, licence number 4436/AL, Casa Palmeira is a wonderful, relaxing place to stay.Many of our bookings come from guests who return year after year, and love it as much as we do.It is hard to describe that makes it so special, but here goes! There is air-conditioning in all 4 bedrooms and the study/library. The living-room has a wood burning fire for cooler evenings, and has 3 leather sofas with lots of cushions, for total relaxation. The 2 double bedrooms have great bedroom suites - a fabulous super-king size cherry wood sleigh bed in the master suite, with matching furniture, and a Portuguese king size bed in the double room downstairs. The study has a wide screen TV, with Xbox 360, and a broadband wireless router, and printer. The emphasis in the whole house is comfort and convenience, with all you would expect from a family home, with perhaps a few extras. Outside: The garden at Casa Palmeira is a delight, full of flowers and mature shrubs and trees, including orange, lemon and guava trees, and with large lawned areas. The lawns are enclosed by hedges, offering privacy and shade, and provide a wonderful place for children to play. There are terraces for sunbathing at all times of the day. The pool is private and heated.We have built a 5-6 person Hot Tub.This is a great addition to the outside space. The downstairs kitchen opens onto a terrace with BBQ. The terrace is laid out with a dining table and chairs, and with large pots of colourful flowers. This area is ideal for outdoor meals as it provides shade from the heat of the sun, but still provides the fun of al fresco! Upstairs, the west facing terrace has a large dining table and chairs, which are ideal for evening dining as that terrace catches the last rays of the sun. The garden area is fully equipped with loungers and a hammock for poolside relaxation. Utility Room: Another fridge/freezer, washing machine and tumble dryer, iron and ironing board. There is access from the utility room to a terrace that is useful for drying washing - never takes long to dry washing in the warm air of the Algarve! Cleaning / Towels / Linen / Maid service: All linen is provided along with bath and pool towels. For all lets of a week or more, there is a mid week clean. For two weekly lets there is a mid term clean and linen/towel change. Further cleaning or towel/linen changes available for an extra charge. Other: Adjacent to the living room is a dining room with table, chairs and sideboards. On the ground floor there is another separate kitchen. The study/library also has a widescreen TV, DVD & Xbox360. It also has a leather double sofa bed for use by arrangement. Spacious and comfortable villa, well equipped and in beautiful surroundings. Lovely garden. We stayed for a week at the end of Feb 2019- aiming to get away for a bit of warmth and to escape the winter in Cornwall. The villa couldn't have been better- masses of space for our family of 5. The area was obviously out of season but supermarkets/ main restaurants open as normal and everyone was very helpful. Being out of season has it's advantages as the whole week was peaceful and relaxing which is what were hoping for. The weather was kind and not dissimilar to an English Summer- but in February! The area is lovely with stunning coastline to compete with Cornwall but with quiet roads and easy driving. The whole holiday was straightforward, easy flights, simple drive to the villa, warm welcome from Maria the manager, and we couldn't really fault anything. The pool was surprisingly warm and we spent a lot of time just chilling out at the villa and following the sun around the lovely terraces and often ended up having a drink on the rooftop terrace with it's panoramic views. A perfect, relaxing week- many thanks, we would love to return. The area around is stunning and we visited Salema, Burgau, Praia de luz and Lagos. All great with some lovely eateries. The villa was fabulous, well equipped and Sam who manages it was invaluable . Lovely villa, well appointed, fabulous pool area. Relaxing week in this lovely villa which contained everything we needed. Greeted on arrived by helpful manager. Used the heated pool and hot tub every day. Lovely beaches a short drive away, great for surfing and bodyboarding. Straightforward directions to Villa, welcome pack made it a stress free start to holiday. Villa is as per the description on website, in a very peaceful part of Santo Antonio. Property was clean with good quality furnishings, crockery and kitchen equipment and owners local agent were helpful when contacted. Local restaurants recommended in Villa information book and golf club bar were excellent. Would definitely return. 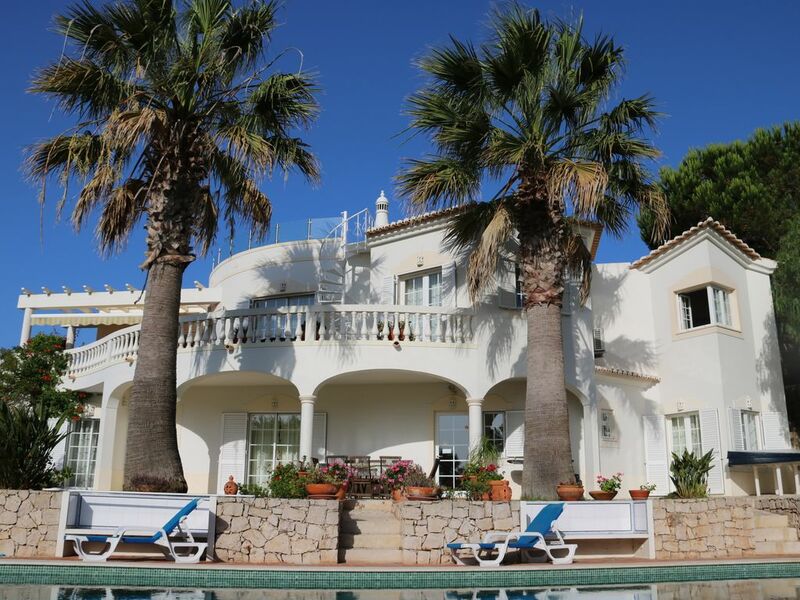 Great villa with beautiful gardens situated in a calm and peaceful position overlooking the golf course.Easy and stress free directions to property. Villa's furniture, crockery and cutlery all of good quality. Plenty of tips in Villa suggesting restaurants within easy reach and if leaving the car at villa a number for an excellent cab service. Golf course was fun to play and the Spike bar is highly recommended. When contacted the local agents were very helpful with any questions we asked. One week was not enough we would love to come back. A beautiful villa in a fantastic location! The villa was amazing , the outdoor space around the pool and the multiple outdoor eating areas really make it the perfect place to relax and enjoy the weather. Location wise it's great, 5 min taxi to the beach and restaurants and 15/20 minutes to Lagos. Customer service was second to none and made for a very enjoyable and relaxing week. Would highly recommend! The Western Algarve is famous for its beaches, and Salema beach is only 2 miles from the villa. It is a beautiful, clean, sandy beach washed by the Atlantic Ocean. Further west there are many quiet beaches to explore, some are easily accessible, some involve a scramble down steep paths. For surfers, there are several suitable beaches within easy reach of the villa. There are also several naturist beaches nearby. Faro airport is the nearest airport to Casa Palmeira and is approximately 1 hour away by road. This is along the dual carriageway which is a toll road, and so very quiet. Lisbon is about 2.5 hours away by car. Car hire is probably essential to enjoy the area to its fullest. The rail links to Lisbon are excellent. We got trapped by the Icelandic Ash cloud ( there are worse places to be trapped!) and made our way home via Lisbon, which actually worked very well. Countryside is stunning. There is a lot to see and do in the surrounding area. Parque da Floresta is set on the edge of the Costa Vicentin Nature Reserve, and there are lovely walks along established tracks in the Reserve. The town of Lagos, with its marina, is about 20 minutes away by car. Inland there are many beautiful old towns, castles and villages to visit, such as Silves. Cap St Vincent is worth a trip, as is the Sagres Fort. There are plenty of supermarkets within easy reach of the villa. The nearest (Intermarche) is only 2 minutes drive from the entrance to Parque da Floresta, and is well stocked with everything one might need for self catering.There is a Lidl supermarket in Vila do Bispo which is about 5-10 minutes away.Be aware, however, that it doesn't take'foreign’ credit cards - only Portuguese cards or cash. Nearly caught us out once - frantically scrabbling at the checkout to find enough cash! Even bigger supermarkets can be found in Lagos. The Restaurants in Parque da Floresta provide lots of variety and the Italian Restaurant even has a takeaway facility. We have also created a book in the villa for guests to leave details of restaurants they have enjoyed (or not!). Fortunately, all the restaurants tried seem to have been good, particularly those at Salema beach, and we now have a list of places that are tried and tested. For the children, there is the Football Academy and the tennis courts with resident coach who does group lessons or individual lessons. In the summer there is a weekly tennis competition for different age groups of children, which is always hotly contested. There are children's clubs, which provide a safe environment for children to have fun, learn and make new friends. These are run by PDF staff. Further afield are Zoomarine and Aqualand water parks. The Spa at PDF is also worth a visit. They provide lots of different treatments, and are not too expensive. There is good medical assistance, if you should need it. There is a surgery in PDF itself, several days a week, and they will help direct you to either a Chemist (Vila do Bispo) or English speaking Doctor (Lagos). In the study, we have now installed a broadband wireless internet connection, with printer. We have not provided a PC, so those wanting to use this connection should bring their own laptop. The printer and connection are provided at no extra cost, but we ask guests to use the paper sparingly.